It can help you learn how to connect with members and others to do real estate business and both you and they can benefit. Ii can be as little as fifteen minutes to show you the power of the Internet, the power of a network of real estate brokers and salespeople, to help you achieve your goals in your everyday business affairs. Listen to a recorded seminar. At least hear about how these people are doing business not on real estate boards! And they are members of real estate boards and associations. Now you can do both!!! Also use this page for any questions, suggestions, enhancements, problems etc. you may have. Demonstrations show how quickly the Internet can work for you. It is the what you have to know, how, when, where, why and what information is making money and how to work it and how to make it work automatically 24/7 for you. There are over 3 billion people using the Internet and over 7 billion mobile phones. May we show you how easy it can be to participate in this Internet mobile revolution. Free . . . no obligation to join. In just 15 minutes you can learn how thousands of others are making connections to do real estate business. See testimonials. This demo will take into account your location, type of real estate you do no matter where in the world you are located, and the kind of business you are presently doing. This demo can be for individuals, companies, organizations, real estate boards and associations and more. This can benefit you just to learn how the service works. It benefits our members too because perhaps you will start learning how to deal with them. This is a win win situation. If you are a licensed real estate professional you will have the option to join for added advantages. But there is absolutely no obligation to join. Every licensed real estate professional is best positioned in the market place to hear about buying and selling opportunities and learning how to work this information as an industry is very beneficial and time saving feature for the world public. If you are a buyer or seller you will learn the power of networking in ICIWorld through networks of people. This gives you greater marketing exposure for the opportunity to find a buyer who appreciates what you have. An opportunity for the highest best price and terms because you have included important, relevant, competent marketing choices out there today. Keep in mind almost all our members use traditional real estate methods which they can include on your behalf that can benefit you. Of course with your approval. But in addition they include this world service that has been penetrating the farthest reaches of the Internet and marketing on the Internet world wide since 1994. Demonstrations teach how quickly the Internet can work to make all in real estate money. if you are challenged or new to computers we can help you keystroke by keystroke and if you are an advanced user you will appreciate some even more advanced features. to work exclusive real estate information in compliance with your licensing body in your state or province that is making members a lot of money, providing great service to the public and you can do it very very easily. 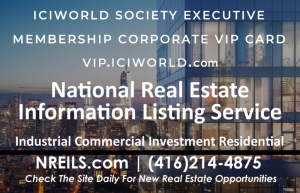 to receive the latest commercial or residential real estate Haves and Wants and listings daily by EMail for a competitive edge in your marketplace, absolutely free. to place information in a world searchable real estate database within 2 minutes and reach 40,000+/- people interested in real estate, This generates leads. to deliver by EMail, your information, instantly to 20,000+/- people interested in real estate. They can contact you directly. This generates leads. links in the Haves and Wants drive traffic to your website, make the phone ring, trigger EMail enquiries. One lead from any ad or call off your website from an ICIWorld widget and you do referrals or show the property yourself and make enough money to pay for 50 memberships in ICIWorld for a lifetime. to measure your results every 90 days and if you are not getting results what to do about it. to promote your website. What good is a website if you have no traffic. One lead makes a lot of money for you. this service can dramatically increase revenue for a member and for all members in a brokerage office. There are unique services here not available elsewhere. some websites trigger leads more than others and the reasons why. Learning this can be like a light switch. All of a sudden you may start triggering leads. our booth at real estate trade shows is one of the busiest booths at the show. One reasons is because we make a statement that you could have a $30,000 website and it is not as powerful as the one supplied by ICIWorld for $199 per year. Learn about the content and why that makes it powerful. Every broker and salesperson has MLS but not exclusive, etc. and how it works. the website is powerful, because of the thousandts of listings, MLS AND Exclusive, Residential AND Commercial, all are used to trigger leads to do REFERRALS as well as business in your local market area. 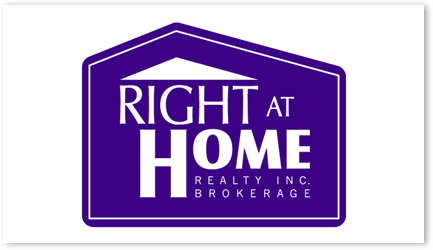 working real estate Have and Want information is absolutely important for every single licensed real estate professional in the business in the USA and Canada and the World if you want easy, extra sources of triggering income and providing extra services to the public so easily. it is important to have a mobile website otherwise you are losing out big time. our pledge is important as a way of measuring that you should be doing business every 90 days or call us. In one sense ICIWorld is similar to classified advertising in a newspaper but to a world audience, in real time, with links to members websites, and more. There are ways to make connections to do business on ICIWorld by just knowing how to search, by key word, by city, by date. We are happy to share this with you because it helps all our members do business with you and others. We will show you how in this short demo. It can work for you the rest of your life helping you do business. There are ways to make connections by joining ICIWorld. Your ads can be seen by public who can now contact you directly for more information and to do business. Without a membership, the public can not call you. The ultimate in world wide exposure is possible only with an Executive Membership. Only then are your Haves and Wants and Listings marketed globally, instantly, on tens of thousands places throughout the Internet. From our extensive experience we feel we can show all salespeople how one can easily be missing doing business and not realize it. May we show you. Absolutely no obligation to join. Demonstrations are done in the form of a one on one webinar workshop. If there are any problems, just call 416-214-4875 at the appointed time and be in front of a computer. This applies no matter where on the planet earth you are located. Depending on long distance we will very quickly make it so that all presentations and/or demonstrations do no use long distance calling. It is helpful if you can be on your computer 10 minutes before your appointed time, go to www.iciworld.com and click on Webinars and click on number 1, today’s workshop and get into the workshop. We do this over the phone. In the future for training sessions, it can be very helpful if you have a USB Headset and Microphone. This will give you almost AT&T, Bell, quality type sound talking through a computer. Otherwise sound is degraded, workable but degraded and not the highest quality. If you are using a desktop and not using a USB headset we will talk with you using a telephone. We can call you if you wish. If you have absolutely any issues simply call direct to 416-214-4875 ten minutes before your time. You can invite colleagues, friends and others in your office to listen in and invite others to join in from their location. Or ask us to send an invitation to them or to you so you can forward it with the instructions to get into the demonstration. As long as they are on a computer on the Internet we can all be together in the Webinar no matter where in the world anyone is located. From 1 to 1,000 may attend. Many of our presentations are one on one. That way we go at your own pace and can answer all your questions. Our training, support and help sessions are conducted this way. Virtually every single person appreciates this quality one on one approach to assistance. We suggest everyone have a pad of paper and pencil handy to take notes. Have a cup of coffee with us and listen in. Any problems at the appointed time call USA 1-954-317-2327 or Canada 1-416-840-6227 Toll Free 1-877-272-1721 or direct 416-214-4875. Services work for every geographic area on the planet earth as long as you have the Internet. We take it as a personal challenge and enjoyment to help everyone in the world to get connected and get real estate information working on the Internet for you and your prospects and clients. It is world and local connections with others to help you do business. Here’s a summary of all of the services you receive when you become an Exclusive Member of ICIWorld. As low as .67 cents per day $240 per year, $319 to get started. Web sites are separate and are free for one month then $19/mo. or $199 per year. Major credit cards accepted, Pay Pal, Interac, by cheque. Any way you want. Specializing in exclusive information and million dollar properties now among the biggest collection database of buyers and sellers of million dollar and up properties. No limit, no minimum or maximum, all real estate commercial AND residential. Special category for World Confidential. Gain world wide and local exposure for your real estate Have and Want ads all year long. Accessible world wide in one of the fastest databases in the world for real estate. Your information becomes available on any one of over seven billion mobile devices world wide as of June/2013 in the form of Apps as well as available to over 2.5 billion people on the Internet with computers. This includes not only advertising your listings such as on your real estate board, but open and exclusive opportunities not on real estate boards. You should also be placing what your buyers and tenants are looking for. Owners of properties can respond directly to you. All new listings and listings modified after 30 days, get distributed to the public and the world real estate industry by EMail! At the moment our last count was 20,000 daily by EMail in addition to readership of 30,000+monthly. You will also have choice to allow or not allow your listings, Have and Want ads to be on thousands of other brokers web sites instantly. What is better to have you listing on one web site or on one thousand web sites? You will learn how to market your exclusive opportunities in an exclusive fashion that will maintain confidentiality of your property while promoting the opportunity. This has totally opened up the market up for real estate sales people to really do business. Members can advertise other brokers and salespeople’s listings (not in the same office) with permission, all FSBO’s, and much more. There is a special way to do it. With a simple membership you can reach a local and world audience of people with a like minded interest in real estate (See statistics). See among the most deals being done and connections being made to do business. See testimonials. Many of them will tell you how easy it was to make a connection. 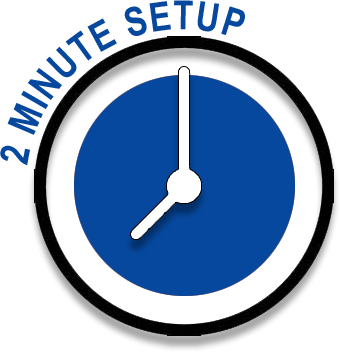 We can show you how easy things are within a matter of minutes once you are a member with one on one assistance conducted over the phone while you and we are on the Internet together. See Daily Webinar Workshops. It is like a doctors by appointment with 30 minute appointments scheduled from 7am daily to ensure you know how to make it all . . . work for you. See Our Pledge that everyone does business or you call us. 75% of the 30,000 listings, Haves and Wants on ICIWorld are exclusive and not on any other service. These exclusive listings as well as listings on a real estate board help you identify people with whom you can and should be doing business with. Build your own database of contacts with notes about your business relationship with them. This is useful for dealing with them on a regular basis so that when you see them place a Have or Want you can decide if you want to deal with them or not. This is a world market of people who like real estate. You should learn there are also two databases. Database 1 – when you are a member you place your information in Database 1 for the ultimate in world wide exposure with your contact information available. This includes name, company, address, city, phone numbers, email address and web site. This drives traffic to your web site! Database 2 – This is for the public to place their Have and Want information and it is free for them. However only the subject line is available for the world to read. Only Executive Members have access to the contact information. People are looking for listings on the Internet and now you will have thousands of real estate listings on your site – structured in a way where YOU get the calls. These are revenue producing links for YOUR website, unless you have no traffic it’s inevitable that you will generate leads! And . . . we have a solution for helping you generate traffic. We have attended World Search Engine Conventions and Conferences and we teach SEO and have forty different important ways to promote your web site. This is important because the highest return on investment (ROI) of any industry on the Internet is for real estate because one lead can make one a lot of money and provide a great service to the public. There are 50-100 new ads automatically added daily, you don’t have to do a thing! It brings people back to your web site to check for new listings regularly. NOTE: If there is one thing better than listing and selling real estate it is referrals. Why? because they average $3,000 to $10,000 and more. The only reason salespeople do not do referrals is because they do not get the leads. Now you will. See links for all your web sites. Why have more than one web site? Read on! They are like billboards, you can have more than one. ICIWorld supports all your web sites. They can be linked together. You only need one domain name on a business card because when your customers visit the one, they can see the link to the other one. they have exclusive listings not available on any other web site. they have the ability to send out both MLS AND Exclusive listings to your prospects and clients of listings that match the description of what they are looking for. THIS IS LIKE A 24 HOUR PERSON KEEPING TRACK OF ANY NEW LISTING AND SENDING IT IMMEDIATELY TO YOUR PROPECTS. When they receive a listing that they like they have to call you for more information and to show the property. See Web Sites and samples. The importance of the web site is the links to listings structured and set up by ICIWorld in addition to other things you are doing. I compare these links to the sparkplugs of a car. You can have two beautiful Mercedes sitting side by side, one with sparkplugs and the other without sparkplugs. They both look nice but only one will go. The same is true for web sites, the sparkplugs are the specially designed real estate links to listings and Have and Want ads. 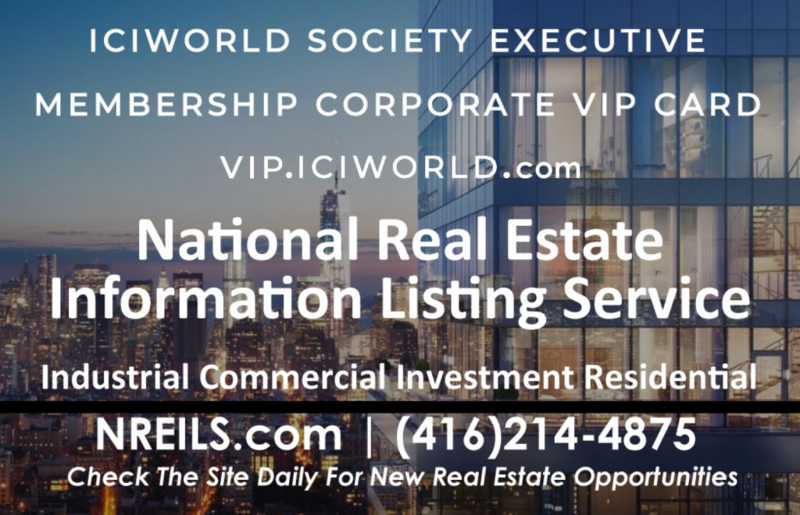 The ICIWorld links can be placed on all your real estate web sites. The exclusive ads on the web site are only available if you have the web site. The ability to send out listings automatically can only be done with the web sites we supply. They will make you money if you apply some basic principles. ICIWorld Website’s display thousands of residential and commercial listings in a way that YOU get the leads. This makes them the most powerful sites on earth. Everyone should embrace the concept that web sites are like billboards. You can have more than one, and if they are all generating leads then why not? Especially if one of the sites updates itself with listings! What good is a web site if you have no traffic going to it? You might as well not even have a web site. Real estate on the Internet provides the highest return on investment (ROI) because one lead can make one a lot of money. A web site is like your office building on the Internet. You are promoting your own business. When you are a member of ICIWorld with the links, you send people to your own web site. How To Promote Your Web Site is so important that this is a monthly world wide Webinar for all members. We do not do this for non members as it is a major competitive advantage for members. We have attended world search engine conventions at considerable cost so that we can learn it on behalf of all members and provide it to you free included in an Executive Membership. You can use the information that you learn for all your other web sites as well. We have spent time at the World Search Engine Convention in web site workshops with Microsoft, Yahoo, Google, and other optimizers and learned how to do it. We share this with you monthly AND in recorded videos of workshops. Only about 4,000 Have and Wants can be seen by the public, but as a member you get to see it all! If you are not a member you miss opportunities to meet people with whom you can do business. Over 9,000 real estate Haves and Wants are placed on ICIWorld by the public. Only members have full access, if you are not a member you miss opportunities directly from the public. Database 2 FSBO Area – Receive Haves and Wants by email (for members only), again, if you are not a member you miss opportunities directly from the public on a daily basis! We build you a link to your listings for your website. When you add a commercial listing to ICIWorld it’s instantly on your website. Add residential homes directly to your website! With your membership you have the ability to modify your listings all year long. This removes the cost to advertise your opportunities to the public all year long on one of the largest web sites in the world for real estate. We deliver 10,000 to 20,000 emails to the public daily. Some of the best responses come within 24 to 48 hours after placing a listing! It would take you thousands of man hours to build databases and keep them up to date to reach all the people who subscribe to receive daily listings by EMail . . . all automatically . . . for all your listings all year long. in your office over the phone everywhere in the world by way ofIt is online. Use a USB headset to listen and talk while online. Also other training by windows video streaming media and telephone support. This training includes personal support on how to work with the web site and how to make the web site work for you; One concept, one idea, one tool, one contact, and you make a lot of money. This area has hundreds. All video training programs included. statistics, lists of buyers. If you can print out a list of 200 buyers of apartment buildings and your competitor can not, who is going to get the listing? Some say it is the most powerful listing tool on the market today. Have fun the rest of your life doing just referrals. The only reason why brokers do not do referrals is because you do not get the leads. Now you will; Would you mind doing the odd five minute referral that makes you money? See our program. ICIWorld specializes in the database. Have it appear with the information you want for the people you want. It can help your group network like never before. It can help your organization grow; It is sophisticated databases formerly reserved for the Fortune 1,000 companies, tailored to suit your company and/or organization. See Search Members and Details for a Search Matrix for your organization. See Search Members. People even search for a member in our testimonials. You will be surprised how people can find you to do business. Searches are done by city, geographic areas and market areas, specialties, languages spoken and more. Members are global real estate people able to market real estate world wide through this world wide service. If you are marketing property in other countries members usually have business relationships with others in those other countries and they receive referrals for generating the business. Access to all Listings including 9,000 Ads placed by the Public. Without a membership you can easily miss making connections to do business. Get it all working for you today. Consider us as a personal marketing and information assistant to you personally. If your car has a flat tire you do not abandon the car. You get it fixed. If you are not generating leads to do business every 90 days with your ICIWorld Membership, website, widgets, fifteen Haves and Wants, call us and give us a chance to help show you how to have things setup properly so they work automatically for you. Let us show you how to work exclusive information not just listings, and how and why widgets are absolutely inevitable to generate leads and more. A short analysis in one 30 minute workshop can be quite eye opening. See Material Defects, it can be like turning on a light switch, all of a sudden the Internet starts working for you. Consider us as a personal Internet marketing and information assistant to you. Support is provided with personal attention one on one by way of 30 minute appointments as needed starting 7am to 3pm daily. It is like a doctors office with 1/2 appointments all day long. Whether you are a beginner, intermediate or expert user of a computer, we provide one on one service at your pace using gotomeeting software. You see our computer and we can switch it to see your computer and help you to search, to place your Haves and Wants on your own, to analyze your website and get it producing leads, to design a complete turn key mobile website for you. If you do not know where to start, just call us 416-840-6227 or send an email to customerservice @ iciworld.com requesting an appointment. The time is now. Then have an orientation workshop webinar 30 minutes. Workshop Webinars – make an appointment for 30 minutes by calling the office USA and the World 954-317-2327 or Canada 416-840-6227. Be on your computer 10 minutes before your time. Go to www.iciworld.com and click on Webinars and follow the instructions to get in to todays workshop. Any problems at the appointed time or to cancel call 416-214-4875. Do not wait for us to call you. We sometimes keep busy serving other people if you are late. Widgets and Installation Guide for Executive Members – Call Lorraine 416-840-5787, or the office 416-840-6227, send an email to customerservice @ iciworld.com and ask to have the instructions for widgets sent to you by EMail so you can forward them to your website designer.Here are the Widget Installation Instructions for your website. Send them to your website designer or get them to help you. After they are installed, make an appointment for a workshop Webinar for us to check the widgets on your website to make sure they are working the best and to make final recommendations such as resource links, mobilization, other specialized links, DDF Feeds, IDX Links, How To Promote, etc. Absolutely any problems contact us. It is absolutely inevitable that they will generate leads from YOUR website or you have little or no traffic to your website and there are solutions for that! Monthly invitation to attend 90 minutes How To Promote Your Website We recommend a minimum of three sessions. They are now recorded. See number 15 in the Training Videos. What good is a website if you have no traffic. What you need to set up on a website first or you can be wasting your time promoting it. To ensure that ICIWorld Services work for you and to ensure your success you must know Our Pledge. Do not go longer than 90 days without doing business, either a deal or generating leads or call us. We are on the Internet where there are five billion plus people. We know how it works. We specialize in helping licensed real estate sales people benefit from the Internet. Virtually 100% of the time we are able to quickly analyze, identify what is needed for you to do to remedy the situation and get you on your way to maximize your opportunities. We simply make recommendations for success as a personal assistant to you. Entering Listings, Haves and Wants Adding, Modifying, Deleting, Subject Line, Business Area and Categories, Spamming, Linking, more. Training Videos These are all ways for you to make money using the Internet learned from helping brokers and salespeople make money using the Internet since 1994. If I am not making money what should I do? How To Promote Your Web Site What good is a web site if you have little or no traffic. This is your office building on the Internet. One lead can make you a lot of money. You are promoting your own business! If you are not getting calls from your website then it is not because of the widgets from ICIWorld, it is because you have little or no traffic. The widgets make it inevitable for you to generate leads. Our monthly program solves this and provides solutions. Testimonials Let this be your inspiration as it is ours to grow the service. Testimonials of members doing business that is exclusive not on real estate boards. We believe there can be as much as ten times the amount of business that one can do on a real estate board and consider both services important and vital to maximizing your business opportunities in the marketplace today. New Sponsorship Program The more salespeople that join, the more information becomes available, the more opportunities there are for everyone to do business. By sponsoring someone else to join you keep your membership down, you increase the opportunities and the new member gets to also join at a reduced rate. Installation Guide for Widgets ICIWorld Widgets Installation Guide (PDF) Absolutely inevitable to trigger leads for YOUR website. After installation please call us or send an email to customerservice @ iciworld.com and we will check the installation on your website to ensure it is working properly to generate leads for you. Ontario One sample of a widget to demonstrate how real estate boards and associations can have this service working for any state or province. Learn the Three Questions (12:09) Members go to Log In and look for Training Videos for the exclusive use of Executive Members. It has helped some members make $50,000 and more within 90 days of learning them. Information the Gold on the Internet One contact, one lead can help a licensed real estate broker salesperson make a lot of money. Sometimes as in a regular gold mine you have to dig to get to the gold, ICIWorld makes it easy by providing contact names and phone numbers for you to call others, develop business relationships with them to do business. Build your contact database with notes on the people you meet, all started from the listings on ICIWorld. Old Listings are used for networking purposes. It is people that do deals. Listings can identify people with whom you may be able to do business with because of the contacts they have. The type of property in their listings along with a price range and geographic area help identify the type of contacts they may have ready to do other business. Recommendations for Success Great for existing members to enhance their use to generate business. There is now a new Internet mobile revolution underway. There are now more mobile devices on the planet earth than there are humans. We provide services that make your Have and Want information available to them world wide. We help you with websites that are mobile so people around the world can visit your website on their mobile phone and search. All this technology makes it easy for you to have an opportunity to others and . . . for them to reach you . . . in a most economical way. You will learn the minimum level of quality to generate business such as in our recommendations for success. Our Pledge re you missing out on the benefits of the Internet? Measure your success with ICIWorld concepts, tools, and technology with this pledge. If you are not generating leads every 90 days that you feel will lead to doing deals, you call us. Why? If you do not call, how can we help you. If you have a car and it has a flat tire, you do not abandon the car. You get it fixed. How do we help. Some examples are material defects or how to promote your web site. Learn these things and you will maximize your opportunities on the Internet. Until then, you are missing out. Simply call anytime to make an appointment. We will point out the difference between making money and not making money and then you be the judge. Fixing things can be like a light switch turning on, all of a sudden you can start generating leads periodically. Pay $319 in full and receive a 4 month bonus for a total of 12 months of service. Work Smarter Not Harder, Use the Power of the Internet! Webinars – Workshops, One on One Assistance, How To Promote Your Website, Recorded Webinars, more. Daily Assistance is by appointment. They are meetings conducted with GoToWebinar software. If the above link does not work use this one. Call 416-214-4875 to make an appointment. Arrive 10 minutes prior. Call if you have any problem within one minute of your appointment time. Demonstrations conducted the same way. Call for time for a Demo. Call 416-628-4313 if you have any problem. Call 416-840-5787 if you have any problem at your appointment time. Technical Support from Citrix Go To Meeting 1-800-263-6317 Our account is service @ iciworld.net Our phone number in the meeting is 416-214-4875 for assistance. Never go one minute past your time without calling this number if you are having issues. These appointments are just like a doctors every 30 minutes. For assistance on your membership call 416-840-6227 and make an appointment usually for a 30 minute Webinar Workshop. Try to get in 10 minutes before your appointment or call one of the above phone numbers. Usually only one Webinar workshop is suggested, one for an orientation, 2 workshops for a website, one workshop if you have not made money or generated leads within a 90 day period. See Our Pledge. Webinar Workshops are conducted every 30 minutes, like a Doctors office, daily, 7am-4pm daily, five days a week, by appointment. Webinar workshops are a quality approach to providing customer service . . . one on one, in your home or business office, over the Internet while we are talking with you on the phone. Executive Member Training and Support Videos and printouts on doing most everything. Register for the next one now! Very helpful for my business and lots of great advice to help enhance it and stand out from others. Great tips that will definitely help get more business. This was a great webinar, I really liked how I got a half hour warning to log in and get ready for the seminar. It was simple and easy, I really appreciated the mute button so zero distractions and kept the webinar on schedule and left the Q&A’s for the end so people could choose to leave if they needed. I think if you can walk away with at least learning one thing to help your business then it is worth it and I learned several in the webinar and recommend it to others. This is so important it is conducted monthly. What good is a web site if you have no or little traffic to your website! There are many reasons to have a website. One reason is to trigger direct leads that lead to a showing or doing a referral or being introduced to someone with whom you can develop a new business relationship that will lead to providing your services for real estate. Examine ICIWorld Widgets and why do we possibly suggest that they be installed first before spending any money on SEO. Of all the industries on the Internet, real estate provides the highest return on investment (ROI) because one lead can make one $3000 to $10,000 to $50,000 and much more! So it becomes important for your to learn how to set up your website first and then how to promote your website. We have traveled to world search engine conventions to learn and we share this and other knowledge in this special Webinar. Q:General Comments, Very Informatics, Great session, as always. I appreciate the opportunity of virtual online training. It enhances my knowledge and retrieves information that was once learnt and perhaps temporarily forgotten. Great refreshment! A: Excellent, Perfect, Very knowledgeable about the subject matter. Q: Do you think this should qualify for Real Estate Education Credits? Demonstrations and assistance for the public on how to use the service Call 416-840-6227 or 416-214-4875 and set a time for 10-30 minutes at your discretion . Then at the appointed time click on Join Todays Workshop above. This is a complimentary free service for members AND the public. We will cover the four ways to connect to do business. Great for the public, developers, buyers, sellers, builders, investors, business owners and more for all real estate asset classes.We will help tailor your mobile device to display the timely information that can benefit you and your company.One $10M+ apartment building was sold within three days. We will show you how to stay in touch.There are properties coming for sale and we will show you how to get on the list to see them the day they are available and much more.Includes power of sales, key word searching, age field, contacts that networking that can help you do business for a lifetime. Demonstrations for licensed real estate brokers and salespeople prospective members – 416-214-4875A) One on one or to your group either with a hands free telephone while watching a computer screen.B) Or get everyone to click on the above number 1 link at an appointment time and all can listen in!Everyone will see and hear what is going on. This is money making real estate services for the rest of your life. Have as many in your office listening as you can or one on one is fine. You must be a licensed real estate broker or salesperson in the USA or Canada. Call 416-840-6227 and set a time for a presentation. Then ten minutes before your time time click on Number 1 above Join Todays Webinar Workshop Now.This is free and there is absolutely no obligation to join. We are happy to introduce and share these cutting edge tools built for you in the industry to any and everyone who cares to listen.Consider us as a personal marketing and information assistant to all licensed real estate salespeople in the world to help you take advantage of the powers of the Internet to serve your prospects and clients on an industry wide, world wide stage.See some of the items covered see demonstrations. As a broker for forty years, and a thousand members input and use, you will see developed a service unlike any other that networks information not just listings. We like showing how you can connect with people to do business unlocking the power of information not just listings on a real estate board which is the best way but not always possible. 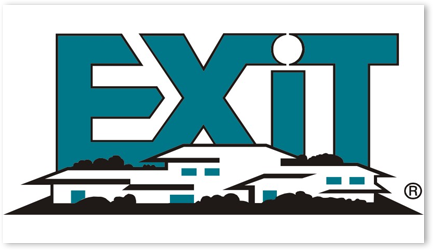 Great for prospective members licensed real estate brokers and salespeople who may be thinking of joining. Absolutely no obligation to join. Internet Webinar Seminar for your real estate office – Call Cecil 416-628-4313 or Gary 416-214-4875 to book a seminar. See sample content.No matter where in the world you are located the Internet and our services apply!Here is a You Tube of sample contentThe Internet Webinar is conducted over the Internet “live” while you and others can listen and watch from your computer and/or mobile device. You can invite as many as you wish and the more the better. Invite everyone you wish to listen in and watch from their computers no matter where in the world they are located . . . all at one time! (Up to 1,000 may attend)When doing a live seminar in your real estate office we can even broadcast live to people who may not be able to attend as long as they have a computer on the Internet. You can invite as little or as many as can listen in your office and invite others at their home office to listen. All will be watching our presentation on your computer screen while we present a power point presentation, do live searches, point out how money is being made, why some generate leads from their website and others do not, take questions and answers, and more.This is a live Internet demonstration to demonstrate how these very exciting and cutting edge information tools are generating leads for licensed real estate brokers and salespeople. There is absolutely no obligation to join, it is educational and you will be able to do business with our members whether or not you join. Recorded Webinars for the Public Search ICIWorld on YouTube. ICIWorld Internet Webinars Sponsored Events ICIWorld can host YOU in your own event sponsored by ICIWorld. 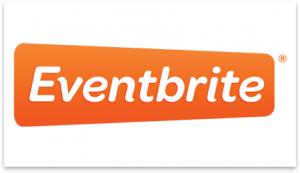 We can host, produce a Webinar with you as a speaker, moderator and you can invite up to 1,000 people to attend. Contact us to discuss.One example is for a broker of record (located anywhere), to introduce a guest speaker (located anywhere), and invite all real estate team members in his/her company (all located anywhere), and have everyone be together on line at the same time seeing a powerpoint presentation or demonstrating things on the web, while everyone is listening, etc. all at the same time.A short message from ICIWorld sponsoring the event at the beginning and at the end in lieu of payment and event is done much like a commercial for a show you might see on TV.Do it at times convenient for all your staff. Everyone can listen in with computers, iPhones, iPads, Androids and any and every mobile device.So calling a meeting does not have to be problem. Just announce it.And . . . it can be recorded for those who can not attend. If you want every single person in your organization to benefit this is the way to ensure everyone benefits. There are solutions and/or work around’s for everything to get every single member up and running very quickly. And for present members it is a great regular tuneup. There are fixes to get websites generating leads, to get fifteen or more listings, Haves and Wants on ICIWorld, to get your listings triggering leads, etc. Here are some items you can work on yourself and/or we can help in a tuneup see checklist. Everyone makes connections to do business or call us. See Our Pledge.